Active recreation parks in the New York City are centralized parks, located in specifically delineated areas apart from other activities. 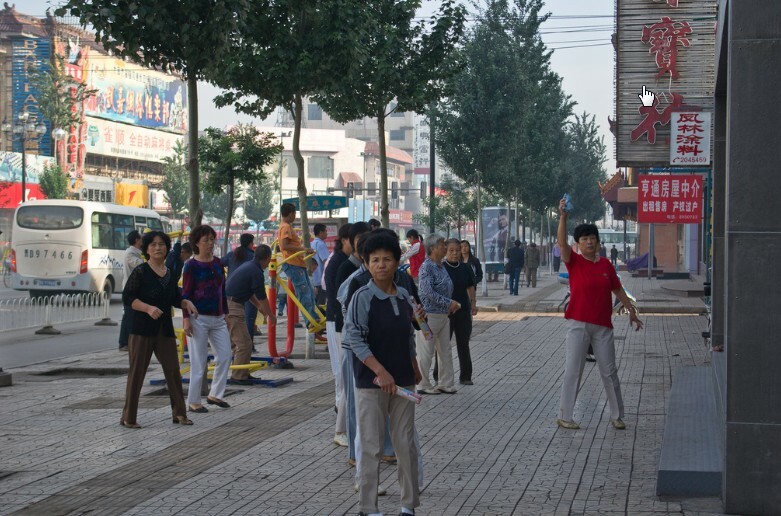 Here is a photo from Daug, China showing active recreation equipment that is embedded into a sidewalk. If NYC businesses can place Sandy and other coin operated children's active amusements rides on our sidewalk space without obstructing pedestrian movement, then I feel this sets precedent for the placing of active recreation equipment for adults on on our sidewalks should be allowed also. and if this don't work we can always follow Los Angeles lead and place them on the streets! We first “discovered” outdoor exercise equipment such as that in the photo above in Santiago, Chile. My kids were immediately hooked on what they refer to as big kid playground stuff. We’ve seen it in parks, playgrounds and on streets in Chile, Peru, Argentina, Thailand and now, in China. 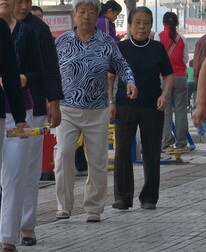 We were walking back to our hostel in Chengdu when we came upon this set of bars and steppers. BigB and CAM (who had just been complaining about walking) dashed over and jumped on the steppers. As they pumped furiously, the little Chinese lady who’d been doing a quiet, calm and gentle work-out looked around as if seeking help from these raucous baboons. Spacing correspondent Megan Hall is in Beijing this summer. Over the next few weeks, she will be sharing her observations of China's capital as it prepares to welcome the world to the 2008 Olympic games in August. BEIJING -- Beijing's parks must be some of the busiest in the world. They range in size from small corners of housing complexes to large, immaculately landscaped gardens. At any hour of the day they are packed with groups playing Chinese chess or cards, or elderly people sitting while their birds sing in cages on nearby tree branches. A reasonably new feature of many of these public spaces is public exercise equipment. As well used as the benches and ping-pong tables, brightly coloured manual machines huddle on the edges of many parks, each designed to provide a slight workout to a specific part of the body. Despite the lack of instructions, Beijingers seem to have learned how each machine works, and although Beijing's parks seem to be used mostly by the elderly population, the machines attract all age groups. 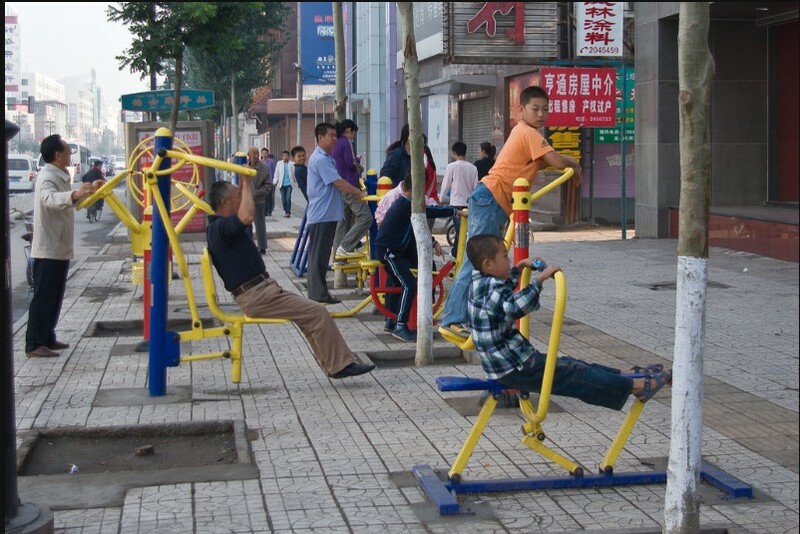 Since 1998, the Chinese government has created approximately 4,000 outdoor gyms in Beijing. Available to residents and visitors alike, these facilities can be found throughout the city’s parks, streets, and other public areas. The national and municipal governments have promoted these facilities through public events such as the annual National Fitness Day and Beijing Olympic City Sports Culture Festival. Would-be gym-goers often site accessibility and affordability as two of the most significant barriers to regular physical activity, so the outdoor gyms are noteworthy for compelling more people to exercise more often. The outdoor exercise facilities include both machines that stretch and strengthen various muscle groups and machines that improve cardiovascular endurance, so they provide the same work-out available at a private gym. But since these machines are free to use, they appeal to the vast majority of the Beijing population for whom the high cost of joining a private fitness club is prohibitive. For other Beijing residents, using the public exercise equipment represents a transitional stage between not exercising regularly and joining a fitness club. Above all, these facilities are intended to improve the health of city residents by helping individuals to incorporate physical activity into their daily routines. The outdoor gyms also afford a number of secondary social benefits. Helping to animate the urban landscape, these machines represent yet another way for people to enjoy Beijing’s public spaces. 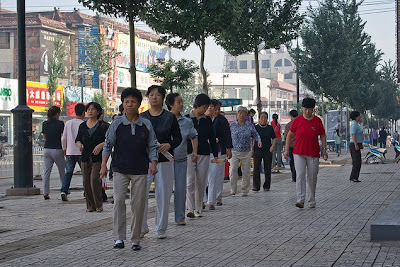 Outdoor exercise has helped youths and elderly in particular to connect with others and to create communities within their city.